Chandni Chowk Lehenga Shops is a must visit if you are a budget bride. Whether you want to spend 20k or 2 lakhs on your wedding lehenga, Chandni Chowk Lehenga Shops have something for every bride. Off late, a lot of Chandni Chowk Lehenga Shops are keeping high-end lehengas worthy of a designer tag. If you are new to Delhi Bridal Shopping, this blog post will help you plan your wedding shopping. On a budget of course. If you have never visited Chandni Chowk in your life, there are certain things you must know before exploring this old market. There are a zillion Chandni Chowk Lehenga Shops. Stores sometimes have the same name. So finding the right one is the key! The salesman will lure you to walk into their stores. Avoid going with them. You will end up losing precious time. Try and get the store contact number and check with them for directions. Ask around for lane names, and not store names. High chance, you might walk into the wrong store on the pretext of being the ‘original’ one. Designer Replica Lehengas don’t come cheap. Think INR 60k to INR 1 Lakh plus for a decent (non-tacky) looking lehenga. Sabyasachi duplicates are always in demand. So bargaining for those might be a tad bit difficult. P.S. If you don’t have the patience to scroll through all the lehenga shops, start from the bottom. I have suggested Chandni Chowk Lehenga Shops starting from INR 15k. So that will give you a pretty solid idea of which stores to target based on your budget. Ok, that being said, let’s explore Chandni Chowk Lehenga Shops. Depending on your lehenga budget, you might ask which out of three should you visit first? Well, in order to pick a preference, check out the different lehenga designs each of these Chandni Chowk Lehenga Shops have. If you like a particular design, but want some minor tweaks, I suggest go to that store first. All of these premium bridal lehenga stores have their own social media pages. So stalking them before shopping is a good idea. I mean they have a legit website + social media pages. That’s how big they are in the wedding scene. It will give you a good idea of the range of outfits they have in their collection. Payal Keyal who is the designer in-house pretty much spins any and every customized outfit that you can hope for. Asiana Couture is what I call the crème de la crème of Chandni Chowk Lehenga Shops. You need to book an appointment before entering this store. They are almost always running full, so make sure you have your family with you when you go bridal shopping at Asiana Couture. Off late, the trending bridal outfit designs are feather lehengas. If you are a bride to be who loves the feather trend, Asiana Couture has some amazing lehengas in pastels and bold colour. They do complete customizations based on your taste. Mind you, customizations does have an impact on the budget. But if you’re ok about shelling couple of thousands extra, do make use of their services. P.S. They don’t bargain from what I have understood. Also, to know individual lehenga prices is next to impossible. You just have to visit the store in order to find out exact prices. When I went wedding lehenga shopping in Chandni Chowk, Om Prakash Jawahar Lal was on my top list. Later I found out, their lehengas are in the premium range. So no luck there. But if you have a decent budget and don’t mind spending on an exotic lehenga, then drop by their store. The Om Prakash Jawahar Lal salesmen are notorious. Period. The sheer number of brides walking in at their store makes them think like they own the world. So keep your cool when you interact with them. Bargaining is key here to scoring that perfect bridal lehenga. If you are looking for designer ‘inspired’ lehengas, then Shrangar Delhi should be your first Chandni Chowk Lehenga stop. They have a gorgeous collection of bridal lehengas. Whether you like pastels or bold colours, heavy embroideries or dainty looking lehengas, they seem to have it all. I wish I knew the individual lehenga prices. It would have made a ton of sense to share that here. But in the case of Chandni Chowk lehengas, there is just no way to find out. A lehenga might be sold to you for x amount vs to another bride it might have sold at a completely different price. So the best thing to do is know the starting prices, and work your bargaining skills around it. Sarees from INR 10k. But good ones cost way more in the INR 40k + range. You have got to check out their Instagram page. They have gorgeous lehengas. From pastels to traditional colours and design, you will find everything here. Their quality is pretty good. Plus the price of lehengas is maybe slightly on the lower end than the previous Chandni Chowk Lehenga Shops. They have recently also started including a lot of nudes and light coloured lehengas that are so on trend these days. Their outfits look elegant, sophisticated, not the cheapo type you know. Also, I see major ‘inspiration’ from Manish Malhotra & Sabyasachi designs. But that’s a different conversation. All of the store addresses mentioned in this blog post can be directly opened through Google Maps. No need to ask around for directions! P.S. 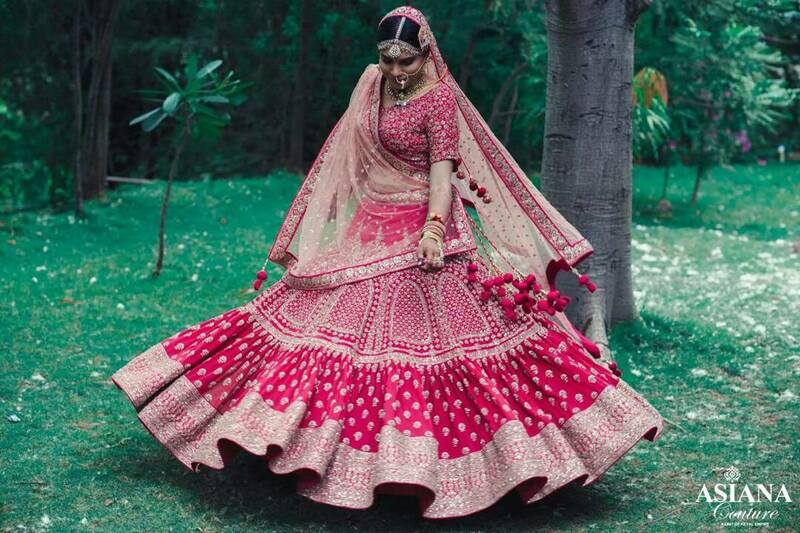 All the bridal lehenga photos shared above are definitely more than INR 70k to 1 lakh. In some cases, it might go as high up as even 2 lakhs. Make sure you manage your expectations on what you might get in your budget before making Chandni Chowk plans. Is it easy to find Budget Bridal Lehengas at Chandni Chowk Lehenga Shops? The answer is no. Budget and tacky-looking go hand in hand in Chandni Chowk. The minute you tell them your budget is under 20k or 30k, they start bringing out the worst of the stuff. Cheap fabric, tacky borders, extra bling, bad finishing the list goes endless. I would recommend you not to go to Chandni Chowk if you are searching for elegant bridal lehengas in the under 35k range. Good stuff is really hard to come by, and you’ll be far more disappointed than anything else. So Where should you Shop in Delhi with a Budget of Under 30k? Now, I know the whole world says Shahpur Jat is for Pre-Wedding Lehengas. Agreed. But, there is no rule set that it has to be. Take some time out and go to every single store and ask them for their starting range and options. You will definitely find some pre-wedding tagged lehenga that you can work with. All you got to do is jazz it up real nice. The best part is you end up getting a legit designer lehenga at the right price. Most of the designers at Shahpur Jat are open to customizations. Unfortunately Delhi Bridal Market is quite expensive. Everywhere on the internet will make you believe that 50k is a starting range for lehengas. Realistically, not everyone wishes to spend that kind of money on a single outfit. That + when it comes to bridal lehenga + reception outfit, it’s a lot of money we are talking. Unlike the bargaining at Chandni Chowk, this store at Lajpat works on a fixed price. Fixed price is always better than bargained price. Unless and until you are a fabric and style genius who knows the worth of the garment, you will be duped in Chandni Chowk. Malhotra’s is quite expensive when you walk in, but they have a long rack of pastel lehengas inside that are priced at flat INR 22,000. This is the price I had seen last year. They had gorgeous embroidered lehengas in nudes, mints, peach, pinks all very trendy colours. The salesman brushed off the collection by saying it was typical mehendi outfits. But I saw the brilliant potential of it being bridal pieces. They even came with sufficient can-can and a fully stitched blouse. Big retail brands like Frontier Raas, Meena Bazaar etc are usually expensive. But they really slash prices during the sale season. It’s the perfect time to go again and again till you find that lucky bridal lehenga on budget. I say again and again because not every lehenga goes on sale the same day. It might be an excruciating task at hand, but will be well worth it if you score a gorgeous lehenga on discount. Want to still explore Chandni Chowk? From the lehenga pictures above, you might recognize the lehenga design. I don’t like suggesting replicas and ‘inspired’ lehengas. But truth be told, a lot of brides ask me for replica stores. The outfits come at a fraction of a cost, and you still get that designer feel that you want. Are you also hung up on that original Sabyasachi lehenga price? Can’t afford it, but want to wear something similar? Head over to Lehenga House. If you bargain well, you can score a bridal lehenga under INR 50k. Remember the minute you ask for designer replicas, every store tends to add a couple of thousands just based on the sheer demand. So, to tell you quite frankly. I haven’t been to this store. When I first saw their collection on Instagram, I thought, eh so gaudy looking. But they have some stunner lehengas in the store which you can see on their Facebook videos. Sequins, bling, heavy embroidery all of it. Although, if you ask me I would say stick to basic bridal colours when you shop at this store. Only because in the same price range there are better Chandni Chowk Lehenga Shops listed above. You might not get the range here which you might get in the other stores. However, their bridal red, pinks, orange lehengas are fantastic. If your budget for bridal lehenga is under 50k, then this lehenga store could have something for you. Keep asking the store guys to show you more and more, till you find the one. Unlike its name, Ram Kishan Sarees actually keeps everything that a bride can choose to wear pre, post, during a wedding. They are your quintessential designer replica store. Oh, the irony behind this photo. That’s a watermarked ‘original’ of an Anushka Sharma lehenga copy!! Because even replicas have to be original! Ok, jokes aside, you can now shop Anushka Sharma Bridal Lehenga at this store. Another designer replica store, there is a huge collection of lehengas you can shop for here. Whether you want a Sabyasachi replica or a Manish Malhotra replica, they have it all. You can get Gota Patti, threadwork, velvet lehengas. Whatever you wish for at a reasonable price. As much as I hate the whole replica business, this one is a pretty sweet deal to check out. The good thing about these Chandni Chowk Lehenga Shops is that they are all lined up in one lane. So just ask around for Katra Pyare Lal, and you should be able to find all of these lehenga stores. I have had so many brides to be asking me where to get customized latkans in Delhi. Well, now you know the place. A good budget store to check out. If you are looking for lehengas in the under 40k range, target these stores first. Browse through their collections extensively, and don’t give up on bargaining. While I didn’t come across too many photos of bridal lehengas from this store. This video, however, gives a good idea of the bridal lehenga collection with prices! I am sure because of the video they have jacked up their bridal lehenga prices. But after good negotiating, you can bring down the costs. So worth checking this store once. Also, did you check out that gorgeous ivory Sabyasachi lehenga for 15k! Are you kidding me? I think that one lehenga just made this store go first in my rank of Chandni Chowk Lehenga Shops. Watched the previous video till the end? Then you would see that they even have Sabyasachi replicas in the INR 20k range. There are multiple reasons why lehengas have such varying price. One obvious factor is the material used and quality of the work. Machine work lehengas cost a lot less than hand embroidered lehengas. Most of the authentic designer lehengas are all hand-work pieces which take months to make. Naturally, that hikes up the price. Another important bit to know is the lehenga flare. Most of these affordable Chandni Chowk designer lehenga replicas come with minimal flare (kallis). Remember that song – ‘Mera assi kalli ka lehenga dekho‘. Most of these stores will give a 12-18 Kalli lehengas which give an almost figure-hugging look. Try negotiating basis the number of Kallis they give you. I found another super useful video link giving prices of bridal lehengas at Navya Collection. If you have a budget of under INR 20k and are obsessed with designer lehengas, then maybe this store will be to your liking. Please note that the lehengas of stores like Asiana, Shrangar are all top quality and cost 10 times the amount. So comparing two stores will get you nowhere, and you will come home disappointed. What’s your Bridal Lehenga Budget?